Folks, have you been at Enchanted Kingdom? Ask me, no not yet! lol:-) This is quiet far from where i live. This amusement park now attracts more tourists visitor. And no wonder why, this is where you can find huge coasters and games that are heart breathing! I can't survive..lol:-) am afraid of the heights! Enchated Kingdom aims to provide quality products and services that create magical experiences for all people specially kids. Enchanted Kingdom offerings to accommodate the challenges and needs of all park goers. This year 2009, new film such as Journey to the Center of The Earth and Speed Racer Grand Pix debuted at the 4D and Rialto Theater respectively. This educational attraction, recently opened for guests and visitors to explore and discover the beauty and fun in science. This had been become more colorful, exciting, lively with the cooperation of the parade showcasing the seven magical theme zones with star studded events. For those who wants to visit and join the fun Enchated Kingdom is located at Santa Rosa, Laguna. 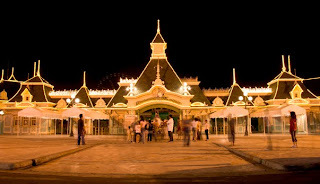 This entry was posted on 2:56 AM and is filed under Enchanted Kingdom , Entertainment , Personal . You can follow any responses to this entry through the RSS 2.0 feed. You can leave a response, or trackback from your own site.